Last week we launched our first User Engagement Top 100 Report, an inside look into the top 100 e-retailers’ email marketing strategies. Today we’re kicking off a three-part blog post series, summarizing each of these strategies. 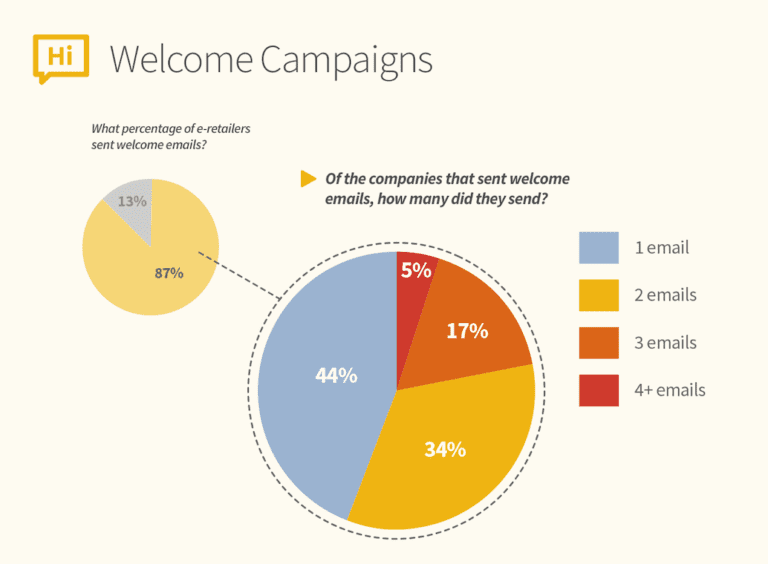 The first dives deeper into welcome email campaigns. As a refresher of our research framework, we created an account for each of the top 100 e-commerce sites and studied how many sent at least one welcome email to new users. We analyzed the email contents and determined industry best practices that all B2C e-commerce growth marketers can apply to their own welcome campaigns. Whether you’re planning to improve your existing welcome campaign or can relate to the 13 percent of e-retailers who have yet to implement one, here are our recommendations to make the perfect first impression. 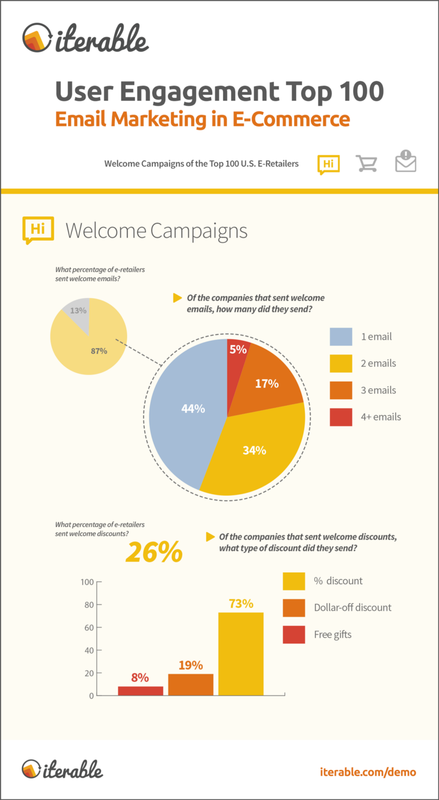 Welcome campaigns are the most widely adopted campaign type by e-commerce companies: 87 percent sent at least one email to onboard new users. However, welcome discounts are significantly less common, with only 26 out of the top 100 offering some kind of incentive. Entice customers to start shopping by including a welcome discount. 15% off a future purchase was the most popular offer included in this campaign category. We discovered that many e-retailers send a simple, text-based transactional email to thank a new user for creating an account, as well as a follow-up email welcoming the user with more engaging, personalized content. Why send two disjointed emails when one can achieve both objectives? Distinguish follow-up emails in a welcome series with unique calls-to-action, such as downloading a mobile app or following the brand on social media, for improved user engagement. Nothing will turn a user off like requesting more information immediately after creating a new profile. Getting to know your audience is certainly the key to more effective marketing campaigns, but why not build a relationship before asking for more data? The first touch is not the time to demand a long form-fill. If your welcome emails are engaging, you will acquire the information for personalization anyway — when the customer makes a purchase! 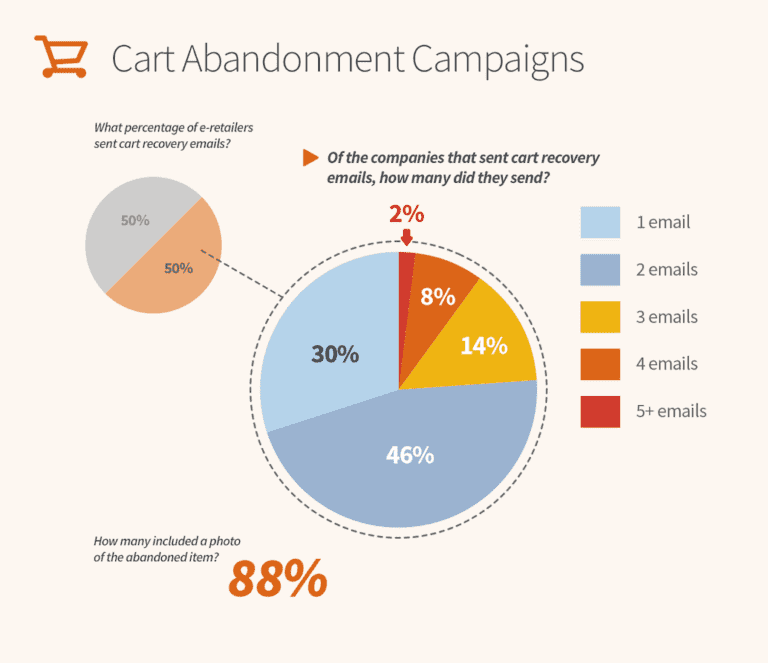 In the next blog post in this series, we will discuss the second email campaign type we analyzed: shopping cart abandonment. In the meantime, you can access the full User Engagement Top 100 Report for more insights and real-life case studies. 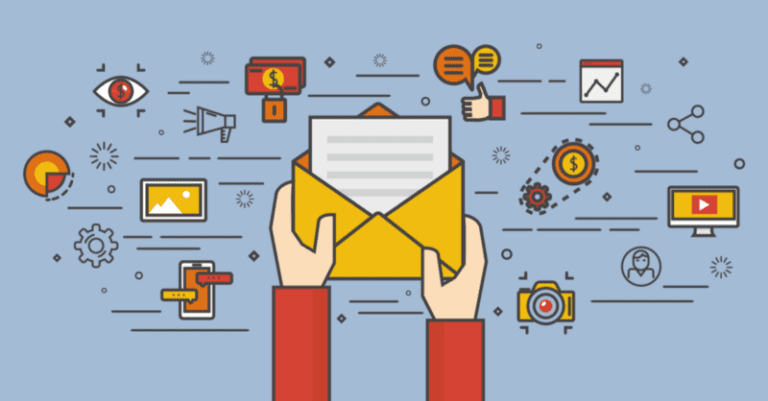 Want to make your email campaigns more welcoming? Request a demo today to put our recommendations into action!